Q: According to reports, the US side is planning to propose probably later today a 25% tariff on Chinese-made goods worth of $200 billion. This is an increase from previous proposal for 10% tariff on these goods. What is your response to this? Could you also tell us that has there been recently any communication between China and the US about the trade issue, specifically, about how to ease the trade tensions between the two countries? A: China's position on the China-US trade issue is very firm and clear-cut and remains unchanged. The pressuring or blackmail by the United States will never work. If the US side takes steps to further escalate the situation, we will definitely take countermeasures to resolutely safeguard our legitimate and legal rights and interests. 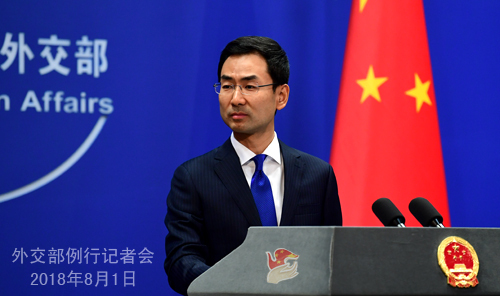 As to the communication or dialogue between China and the United States, I want to tell you China always believes that the trade frictions between China and the US should be resolved through dialogue and consultation. The international community knows fully well our sincerity and the efforts we have made in this regard. Meanwhile, I would like to stress that dialogue must be based on mutual respect, equality, rules and credibility. Coercing and pressuring others unilaterally will only be counterproductive. Q: What is China's response to the request by Australia's Foreign Minister Julie Bishop to visit China? Do you expect Foreign Minister Julie Bishop to visit China this year? Does the apparent delay in China's responding to this request represent the tensions in the current bilateral relations between China and Australia? A: The communication and exchanges between China and Australia are always smooth. I want to stress that a sound and steady China-Australia relationship serves the fundamental interests of our two countries and two peoples. We hope that Australia can work with China on the basis of mutual respect and treating each other as equals to better enhance our mutual trust and cooperation, so as to create enabling conditions and atmosphere for our practical cooperation in various areas and ensure that the China-Australia relations can move forward along the right track. 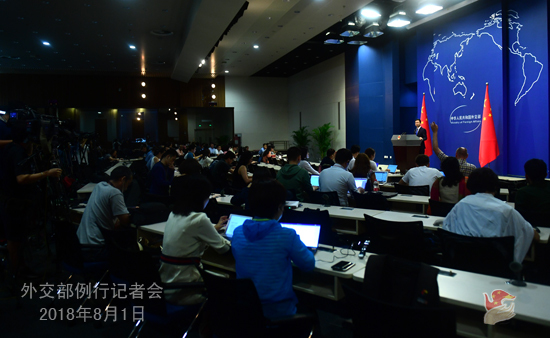 Q: According to reports, the US side said yesterday that China may be getting in their way on resolving the DPRK issue. Do you have any comment on this? A: China's position on the Korean Peninsula issue is well known to you all, so I will not repeat it here. For a long time, China has made unremitting efforts to promote the political settlement of the Korean Peninsula issue, which has been universally acknowledged by the international community. In fact, China and the United States have always maintained close communication and coordination on the Korean Peninsula issue. We hope that all relevant parties can work with China to seize the opportunity presented by the current detente on the Korean Peninsula and meet each other half-way so as to realize the political settlement of the Korean Peninsula issue and achieve the denuclearization of the Peninsula at an early date.